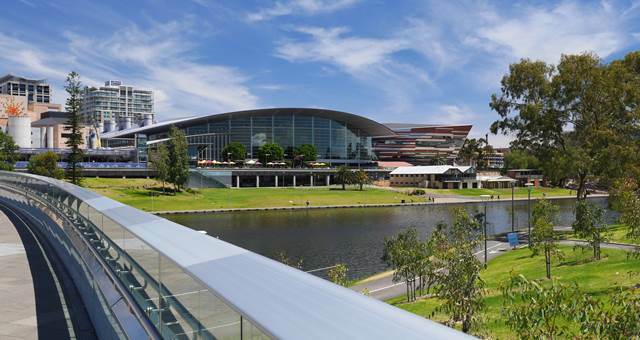 The Adelaide Convention Centre has been named as a finalist for Australia's best Function - Convention Centre in the prestigious national Restaurant and Catering Australia Awards to be held in Brisbane in October. The Adelaide Convention Centre has been named as a finalist for Australia’s best Function/Convention Centre in the prestigious national Restaurant and Catering Australia Awards to be held in Brisbane in October. The Centre qualified for this award after winning the state award at the 2012 South Australian Restaurant and Catering Awards for Excellence dinner last week. Judging for the award took into account the quality of food, service and atmosphere. Judges commented that the Centre managed to deliver a high quality a la carte style restaurant experience while catering for hundreds of guests. Sunil Malik, (left) Deputy Chief Executive/ Director of Operations at Adelaide Convention Centre accepting the award. 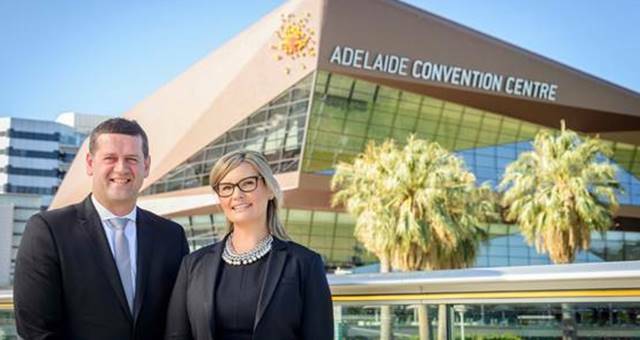 Adelaide Convention Centre Chief Executive Alec Gilbert said the Centre prided itself on providing guests with an intimate experience and making each guest feel special, whether dining at a function for 20 or 3000. On the night the South Australian Restaurant and Catering Award judges visited the Centre, the tiramisu dessert at the function was made in large traditional Italian bowls and then served individually to guests at their table. Judges commented that the meals prepared by the Centre showed obvious care to visual presentation, ingredient complementarity (taste, aroma, colour and structure), freshness and consistency. “The food and wine at the Centre showcases the best of South Australia with 95 per cent of all the produce we use coming from the state including Port Lincoln tuna fish, Coffin Bay oysters and Spencer Gulf prawns,” said Gilbert. Judges for the 2012 South Australian Restaurant and Catering Awards also made special mention of the Adelaide Convention Centre front of house staff noting it was obvious that staff were able to engender and maintain a sense of fun in the job while showing a good standard of technical skill. The national Restaurant and Catering Australia Award winners will be announced in Brisbane on October 29.